Did I tell you about the new dog? 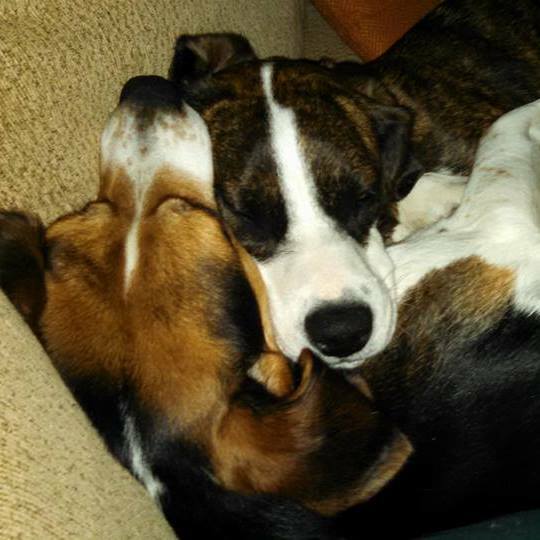 His name is Murphy (the one on the bottom of the dogpile underneath by beagle-boxer mix Riley). We’ve had him about two months now, and other than a little toy aggression on Riley’s part (used to being an only child), they get along great. Murphy is much more respectful of Dax (our cat) than Riley, who still hasn’t figured out that hissing and swatting are not a game. On a side note my cat is a bit of a badass. About three weeks ago she came inside with a wound about the size of a quarter in her side. She didn’t meow or complain about it, even when the vet had to put three staples in her. She didn’t pick at the wound or anything, and is now well on the way to recovery. Both my wife and I have a greater respect for her, though we still have no idea how she came by such a battle scar. And in case I didn’t mention it, Coonie, who graced our house for about three weeks was adopted from the shelter a couple months back. We would have loved to keep her, but Dax wouldn’t have it, which in the long run is for the best since Murphy came around. So here’s how Murphy happened. I was out at Starbucks working on my sermon when I get a call from my wife telling me I had to come home immediately. She was getting Riley into the car, and was going over to the shelter to meet this new Beagle she’d spotted on the website. I wasn’t sure we had enough room in the house for two dogs (even though we have a four dog yard) but my wife has always loved purebred beagles. Truth is, though I was a bit grumpy about it for the first few weeks, Murphy has been a great addition to our home. If he’d been as energetic as Riley I might not be so thrilled, but he’s a real snuggle-bug. He’ll latch onto you on the couch and huddle close all evening. And he’s pretty tolerant of being flipped to the side so he can get some back-scratching along with Riley. And he’s adopted the laz-y-boy in my basement office as his new favorite spot. Probably most of my reluctance at first was that he reminded me of our previous dog, Simon, who I’d known for eight years and missed a little more than I’d realized. Still Murphy is his own dog and he’s a great companion. He’s definitely more of a mama’s boy, but both of them barrel to the door to jump on me when I come home from work. So two dogs, a cat, and maybe in a year or two a mini-me. Life is good.